115th Siege Battery, Royal Garrison Artillery, B.E.F. Harry Hadley was born in Great Malvern on the 18th February 1880 the youngest son of Mr John Hadley of Poolbrook. He served with the Royal Garrison Artillery before the war, but was a plasterer and tile layer when he re-enlisted in October 1914. He served at home until June 1916, and then went overseas with the 115th Siege Battery. He saw active service until in the early hours of Boxing Day 1916 at Pozieres he suffered severe burns to the hands and face when the dugout in which he was sleeping caught fire. A Board of Enquiry decided that a cinder from the fire set clothing that was hanging to dry. However, in front of a Medical Board it was stated that a German incendiary shell set fire to the dug-out. However the fire started, Hadley suffered second degree burns to the face and his right had was so badly injured that it was rendered useless. 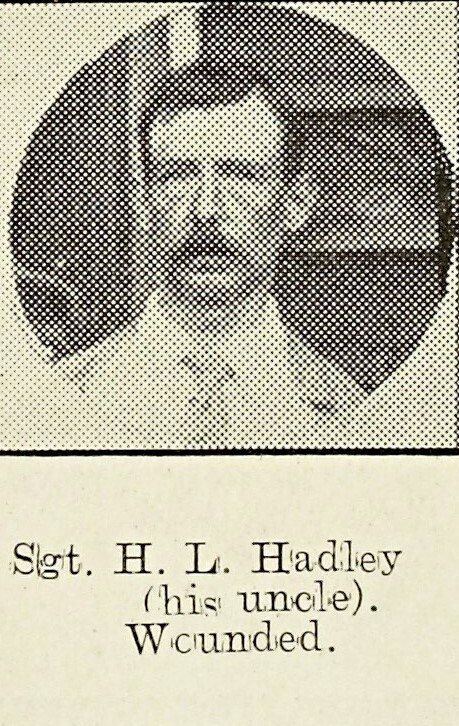 News of his injuries did not reach Malvern until May 1917, when his brother Mr E Hadley of 1 Oak Cottages, Poolbrook heard that he was in an English hospital. He was treated for some time in hospital, and was eventually discharged from the army as permanently unfit on the 16th August 1917. He died unmarried, on his 38th birthday undergoing major surgery at St George’s Hospital, London.